Today is my blogiversary. Six years — I can hardly believe it. What amazes me is the world and opportunities that my blog has opened up for me. Thank you all for being part of it. 1. What is Wendy’s brother’s first name? 2. What is Wendy’s middle name? 3. What was Wendy knitting when she made her first blog entry on April 1, 2002? 4. How many iPods does Wendy have and what are their names? 5. What was Wendy knitting during Hurricane Isabel? 6. What was Wendy knitting when she bought her current car? 7. On what date did Wendy first mention The Loopy Ewe in her blog? 8. Name a rock and roll legend who was born in the town in the UK where Wendy lived as a child. To enter the contest, send your responses, numbered 1 – 8, to the Official WendyKnits Blogcontest email address: blogcontestATcomcastDOTnet. The deadline for entering is NOON (U.S. Eastern time) on Thursday, April 3, 2008. Everybody in the world, except for L-B, the KOARC, and my mom are eligible to enter. 🙂 In the event of a tie, a winner will be chosen at random from among those with all (or the most) of the correct answers. The grand prize is a $50 gift certificate for The Loopy Ewe. I will likely offer some runner up prizes as well: your choice of a WendyKnits sock pattern and a skein of sock yarn. On to knitting . . . Thanks for all your lovely responses on my Lismore so far. It is colorful, isn’t it? I’ve not fiddled with the yarn at all — I am knitting as it comes from the ball. I love the subtlety of the color changes of this yarn. It really is addictive knitting — I keep going because I’m fascinated by the slow color changes. Thanks also for the nice comments on my corrugated ribbing video. Yep, that’s my voice doing the commentary (I considered asking the KOARC to do the commentary because he’s got a great “radio” voice, but that would have involved me writing a script, etc. ), but that voice is quite different from what I hear in my head. You’d have to ask someone who has heard me speak how close it is to reality. Wait — did I record that before or after the large shot of whiskey I consumed? That could explain things . . .
By the way, I’m getting a WordPress upgrade tonight, so there may be some brief outages. Now if you’ll excuse me, I have to go play with Lucy . . . Happy anniversary! I’ve been reading your blog for about 5.5 years, and because of your generosity in sharing information my knitting has improved, both in skills and enjoyment. You have brought laughter and tears to your reading public. Many more years, please Wendy. By the way, your new sweater is gorgeous. I’m not even going to attempt the quiz/contest, but definitely wanted to congratulate you on your landmark. Yours was the very first knit-blog I discovered, you know. The first blog, even, and the first one that I made a point of reading every day. I started spinning after you started talking about it, too–I’d always wanted to learn but didn’t realize it was possible until you started showing your drop spindles. And yes, reading your blog helped inspire me to start my own (even if mine doesn’t get anything like the readership yours does). I’m glad for all sorts of reasons that you’ve been blogging for 6 years, Wendy, so, thanks! Happy Blogiversary! I don’t stand a snowball’s chance on the quiz, but it’ll be fun to learn the answers later 🙂 I really enjoy your generosity in sharing your knitting knowledge and seeing what Lucy is up to. Checking for you blog update in the afternoon is often the difference between me staying sane and not…it is so often the bright spot in a stressful day and I appreciate having that to look forward to. Thank you Wendy! Happy Blogiversary!! I can’t even imagine coming up with things to say on a blog for that many years. I may be in trouble eventually. Anyway, I’m so glad that you have shared so much with us over the years. Your knitting continues to inspire me! I agree with Tracy (above)!! I don’t stand a snowball’s chance either, but am looking forward to the answers -and congratulating the winner 🙂 Your blog is a very bright spot in a sometimes weird and stressful world! I am a rather late-comer to your blog, but really enjoy it! Especially love the pics of the lovely Lucy and your daily progress on your knitting projects! I still am in awe of (and bow to) your craftsmanship and speed!! Blog on! luv.m. Happy Blogiversary! I enjoy reading your blog and seeing all the lovely things you knit. Happy Blogiversary!! You have most definetly been a creative enabler. I am not able to emulate you in the singlemindedness of the project, but I enjoy a good example set before me. You’ve also encouraged me to delve into my stitch dictionaries a bit more to embelish those generic toe-up socks. Thanks for your knowledge, wit, and Lucy. Happy Blogiversary. After being a blog lurker for years, your blog was the 1st that I ever commented on & it still is where I comment most frequently. You’re so generous to entertain us 5 days a week. 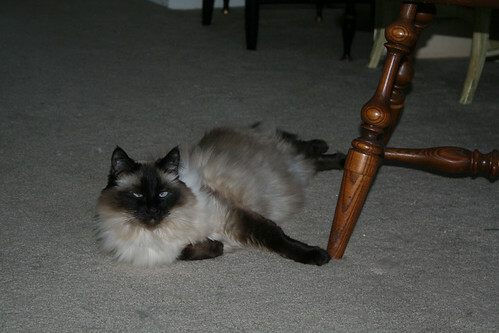 I don’t know how you do it all – work, blog , knit & care for our beloved Lucy. The Lismore is beyond beautiful! Whoa! That yarn is knitting up beautifully! And happy blogiversary! I’ll be celebrating my 6 year blogiversary this summer — I can hardly believe it’s been that long. Happy blogiversary! I can’t believe it’s been six years already! (What’s scary to me is that I’ve been reading your blog for about over half of that! O_o) Honestly, I don’t know where I’d be without your blog right now. You were the first one to dazzle me with lace shawls, and to inspire me to knit some lace of my own for the first time. Happy blogiversary to you! And many more! Congratulations Wendy. Your happy Blog is a wonderful place to enjoy, be inspired, learn and share in the passion of a special person. Thank you. Your blog is a bright spot in the late afternoon when my brain is fading. Thanks for sharing your knitting and Lucy. Can’t say much more than has been said already- you’re an inspiration. The sweater is beautiful- the color changes are so subtle, I have to look twice to see them! Cool. Happy Day! May the fun never stop! Happy Blogiversary Wendy. I started to read your blog within the past year. I can’t tell you how much I enjoy it. You are a kind and generous person and I wish you many more. I love seeing Lucy too. Your sweater is beautiful just what I would expect from you. You never cease to amaze me with how fast you knit. Thank you so much for everything you do for all of us. I’m not going to attempt the contest cause I only know the answers to about 3 of the questions. And for all who want to know…yes! that is how Wendy really sounds. I loved that video. Do you suppose you could show us (in slow motion) how you knit — just plain knit? I was intrigued by the way you hold the yarn and the speed w/ which you knit those knit stitches and would love to see a video w/ the whole process slowed down. You are the fastest knitter in the universe. I’m convinced of that and after seeing that little bit on the ribbing, I’m even more convinced. Thus, my request!! Happy blog birthday. And many many more. Yours was my first blog, too, and I look forward to it every day (except Friday and Saturday, of course). I’m really fascinated by the Lismore–coloring and pattern. My first sweater could well be with Kauni yarn . . . Gorgeous as always, and kisses to the demanding miss! Congratulations on 6 years of blogging. Thank you for taking the time to show us your knitting and your dear Lucy. I’ve been reading your blog for about 4 years and I’ve really enjoyed it. Congratulations on your Blogoversary and thank you for your blog. It’s always a pleasure to see what you’re knitting and a photo of darling Miss Lucy. Happy Blogiversary, Wendy! Yours was the first blog I read, too, and I love reading it every Sunday-Thursday. Your knitting is so inspiring (but I must admit that I love the photos of Lucy the most! )–and you introduced me to The Loopy Ewe! I’m not entering the contest, but I’ll look forward to reading the answers to the questions. I hope you’ll post them! The Lismore is gorgeous. How are the new socks coming? Happy Blogiversary! I can’t believe that it has been 6 years! I really enjoy reading your blog & you are the one who taught me my 1st toe-up socks. I had only knitted 1 pair of sock from the cuff down & hate the method. Until I found your blog & your free pattern, I decided to give it a try & have not stopped since. Thanks Wendy for the great inspiration! Happy Blogiversay to you! …and many more…. May I accept fiber bribes in return for answers? Mwahahahahaaaa!!! Happy Blogiversary Wendy, I love your blog, I love the look o fthe new sweater as well. You were the one who inspired me to try my first sock using your generic toe up pattern, and helped me along the way. Thank you for all your inspiration and sharing your knitting with us. Hope for many more years to come. I am not going to attempt the contest either, I have been reading for 2 years, but I don’t think I know that much. Although I rarely post I read your blog daily (most days the last four years or so) and enjoy it very much, I’m always happy to see a new post and catch up with what you are knitting and the antics of Ms. Lucy. Thank you. Hey Wendy I have a question… what does the ribbing on the Lismore look like on the reverse? 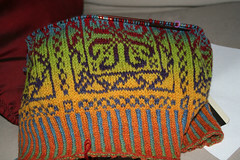 Is it just ribbing or does it look like fair-isle? Happy Anniversary!! I have a question. The Lismore, does that yarn produce the design and everything? I have not figured it out yet. Hugs to Lucy!! Happiest of Blogiversaries! You’re an inspiration each and every day. I have to say that I’m waiting with bated breath to see what Lismore turns out like… I’ve got some Kauni burning a hole in my stash and still don’t know what to do with it. Hurrah for six years and wonderful expectations for more to come! OH MY GOSH! I LOVE HOW THAT SWEATER IS TURNING OUT! I’m so scared to try a fairisle, but this just might get me over the fear enough to at least buy the yarn for it! 🙂 It’s just absolutely stunning! Can you please get LB to do a voice clip as well? Since your voice in my head is so different, I’d like to see how far off the base I am with hers as well! Happy Blogiversary! I look forward to reading your blog every day and even learning a few things once in a while! Congrats on 6 years!! I look forward to meeting you at the Spring Fling in a few weeks. I drink my early coffee with You every weekday morning. Thank You for the good company. Well, I’ve entered, and may not have gotten them all right, but it was fun looking! I enjoy reading your blog as often as you post and look forward to more! Wow, six years! Congratulations and giant hugs!! I have a cat named Lucy also! Well happy blogiversary… wow! SIX!!!! I’ve only visited a few times, so I have no idea, but congratulations! (chris sent me over). Happy Blogiversary! A good time to thank you for all that you share! Thank you so much! I have only been reading your blog for a couple of years, no way do I know the answers to your questions! I do LOVE your new work in progress, Lismore, the color changes of that yarn are amazing. Lismore is beautiful and you are a treasure. I have been reading your blog for several years–never miss it since it is front and center on my home page. Thanks for all the years of knitting help, useful reviews and links, and most of all thanks for Lucy, Lucy, Lucy! Congratulations Wendy and thanks for the six years I’ve been enjoying your writing. Yes, you were the first knitting blog I found too. I’m so pleased you’re knitting an AS design again. It’s been a while and I was looking at the island of Lismore last week! Happy Blogiversary Wendy and Lucy! Happy Anniversary! I thoroughly enjoy reading your blog and wish you many more years of success with it. I’m throwing in the towel (yarn) on the contest though. I’m a newer reader and don’t know the answers. Really good questions….. Simply put, I think that is going to be the most beautiful sweater. Ever. I wonder if you made the non-symmetry of the narrow svertical columns (to the left and right of the middle one with the big flower motifs) intentionally. At least they are symmetrical in the original pattern. Happy Blogiversary! You and Lucy are bright spots in my day. Happy Blog Anniversary – wow 6 years….I’ve been reading your blog for quite some time, but I don’t think it’s been 6 years! Happy blogiversary. I have a question. With all the (lovely) knitting you do; and the playing with Lucy…who does your housework and feeds you? I’m feeling like such a slacker! I don’t know any of the answers, but I just wanted to tell you happy bloggy-versary. Six years is a LONG time in bloggy land! Happy Blog-iversary! Hope you can celebrate by finishing the corrogated ribbing. I am a day late wishing you a happy blogversary but the good wishes are still the same 🙂 Thanks for teaching me so much! Sorry to be late to the party. Congratulations on your blogiversary and a BIG thank you for sharing your knitting life – and Lucy – with us. I am loving what you are doing with your Kauni yarn! Congratulations on your Blogiversary, Wendy! That is soo cool! BTW, I was able to buy a skein of the gorgeous Tempted Glamor Girl yarn that you knit with beautiful pinks and reds and silver thread in it, from TLE tonight! I was so happy! Thank you for knitting it up, so I could see just how cool it really is! I just sent my contest entry in. This has been fun! (Hope I got them all right) I enjoyed reading some of the older blog entries and learning new things about you and your projects. Izzy seemed like a lovely cat–commiserations on his demise. And, what a surprise to read you had not knit any socks for 2 years(!) at one time. What did you work on on the train? What an opportunity to review some of your lovely knits! Thanks, Wendy, for such an entertaining and informative blog. Happy Blogiversary!! I’m also going to try your method of doing the corrugated ribbing; thanks for the video. Happy Blogiversary! I totally missed the day and the contest, but it was fun to read the questions! I still really enjoy the blog, and read yours in the last block of those I like the most! Your Lismore is pretty – I look forward to more.